Last night, the weather here was absolutely beautiful. After a week of 100° days and evening thunderstorms, the weather finally broke, and we experienced the 80s again. Gotta love Maryland! 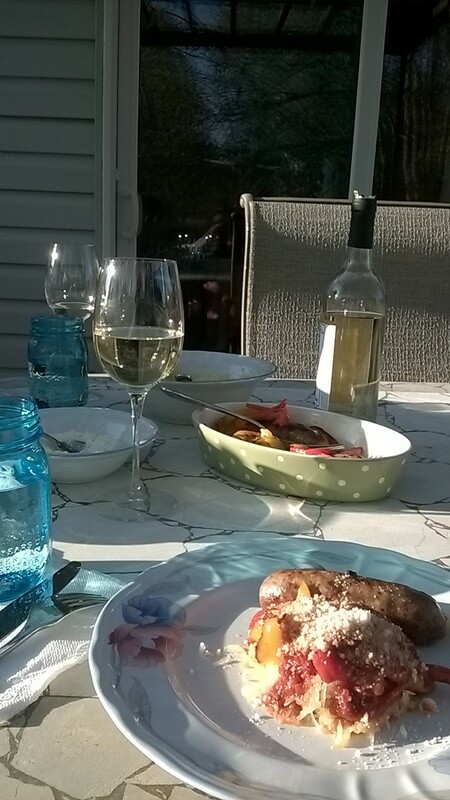 It was so great to finally be able to eat outside! People don’t realize how crazy the weather is in this state. You literally can experience all 4 seasons in the same week. Wednesday felt like summer in the tropics. Last night felt like Autumn. To take advantage of this gorgeous opportunity, I decided to make Chicken Caprese and dish it on a bed of garlic spaghetti (spaghetti aglio e olio for those of your who aren’t familiar with the Italian-American term), presented in a gorgeous plate I got for my wedding from Williams-Sonoma. Minimum effort for maximum deliciousness. You seriously cannot get any easier than this. I found it on Pinterest, then made it my own. The only thing I should have done differently is remove the foil for the last few minutes to brown the top a little. Also, it would probably go very well with spaghetti squash, if you’re trying to be good. 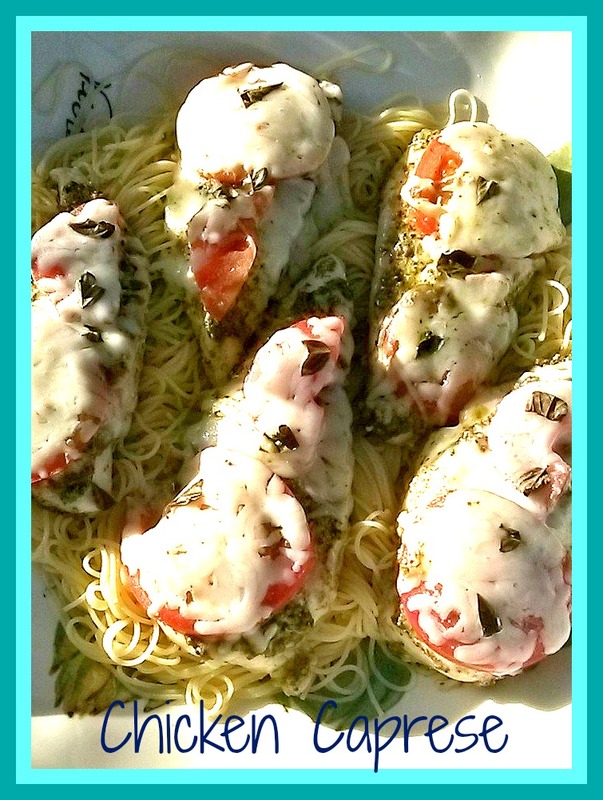 Spread pesto on top of chicken. Top with tomato slices, cheese, and basil leaves. Cover and bake in 375°F oven for 20 minutes. About a week ago, James and I started working out together to Shaun T’s Rockin’ Body. It’s really intense and definitely takes a lot of effort, so I’ve been trying to cook a little healthier so we don’t sabotage our exercise. We don’t have a particular diet, really. Just trying to go whole grain with lots of veggies. 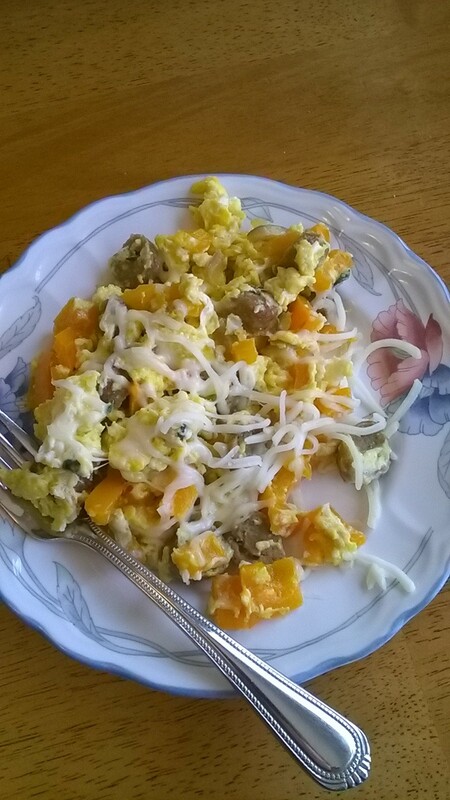 Saturday Morning, I sautéed some peppers, red onion, and thyme from my herb garden, sliced up a little sausage, then mixed in an egg and added a little cheese on top. It was really good! After breakfast, I went to the grocery store and bought a bunch of fruits, veggies, quinoa, Ezekiel Bread, and chicken. It’s hard to eat poorly when your house is full of healthy stuff, right? The rest of the weekend was nice. Sunday after church we took a walk to the library. I picked up a few random history things- one about medieval female rulers of England and one about little known snippets in American history. Then we went to our local farmers market and bought crab dip mix, a soy candle, pizza for lunch, and wine for dinner. Sunday afternoon I cooked my first spaghetti squash. It was really good! We both enjoyed it. All you do it cut it in half, scoop out the seeds, brush with olive oil, and roast face-down in a 450°F oven for 30 minutes. Let it cool, then scoop out the flesh with a fork. So easy! We ate ours with sausage and peppers. We got so much done this weekend, but still had time to eat healthy, take walks, read books, go to Mass, and visit family. I love our beautiful life. This weekend, my fiancé and I went to Philadelphia. We both love it. He’s a huge fan of the Philadelphia Soul (Arena Football), I love colonial history, and we both love cheesesteaks. 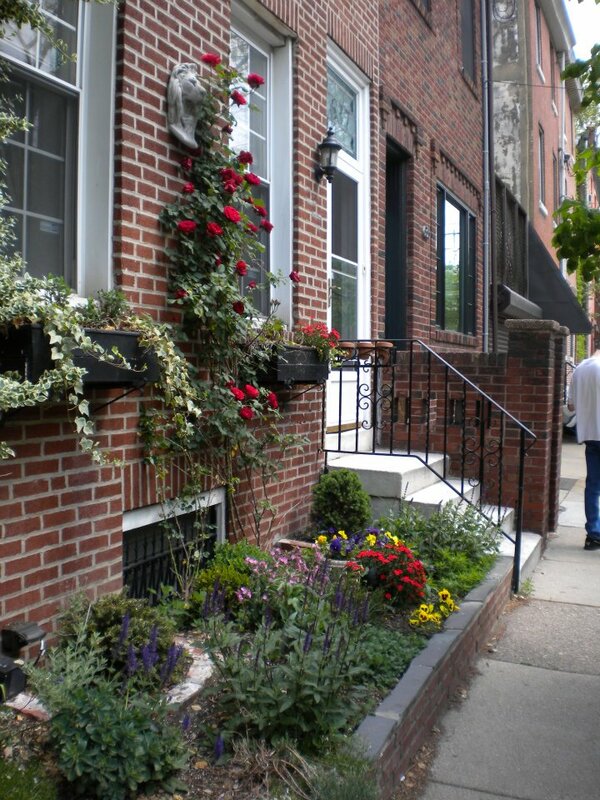 So of course, Philadelphia has a special place in our hearts. This weekend, our excuse to drive 3 hours to Philly was a Soul game on Friday night. 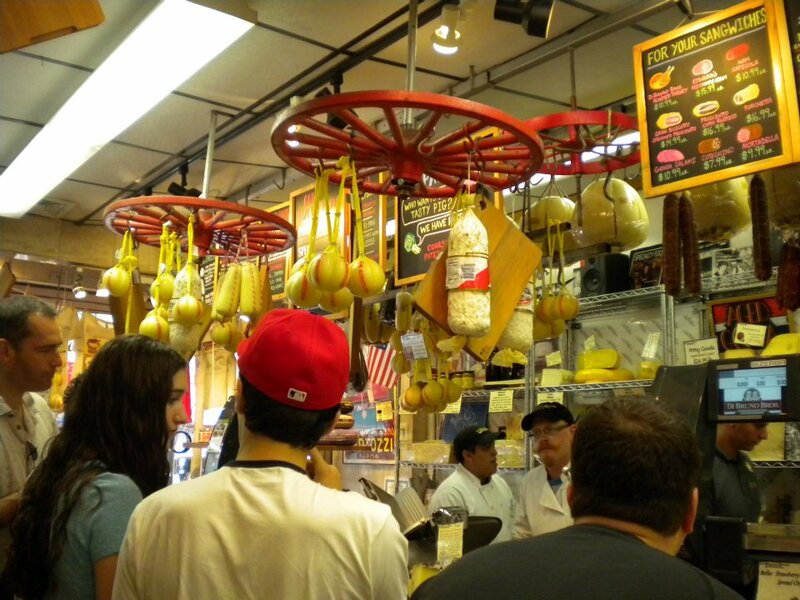 Saturday, we spent the better part of the day roaming around South Philly and the 9th Street Italian Market. May I just say that for the first time in my life, I was sad I had eaten a huge hotel breakfast? This place smelled AMAZING. 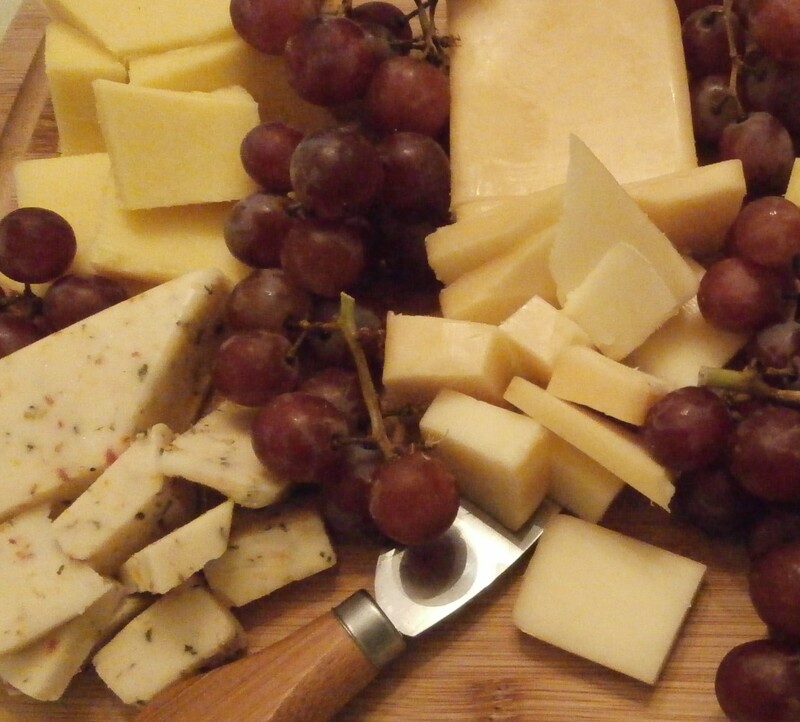 So much cheese, meat, pasta, olives, sausage, you name it. After about 5 seconds, I was fantasizing about moving to Philly and shopping here every morning, then going home to our cute historic row house and making dinner for James. In one of the shops, I ran into the longest spaghetti I’ve ever seen. It was about 2 feet long in the package, but it had been folded before it was dried, so each strand was about 4 feet long. Then, for the first time in my life, I came across Candelone pasta- tubular pasta about 1 inch in diameter, and (again) 2 feet long. Luckily, I didn’t have to use the bathtub. 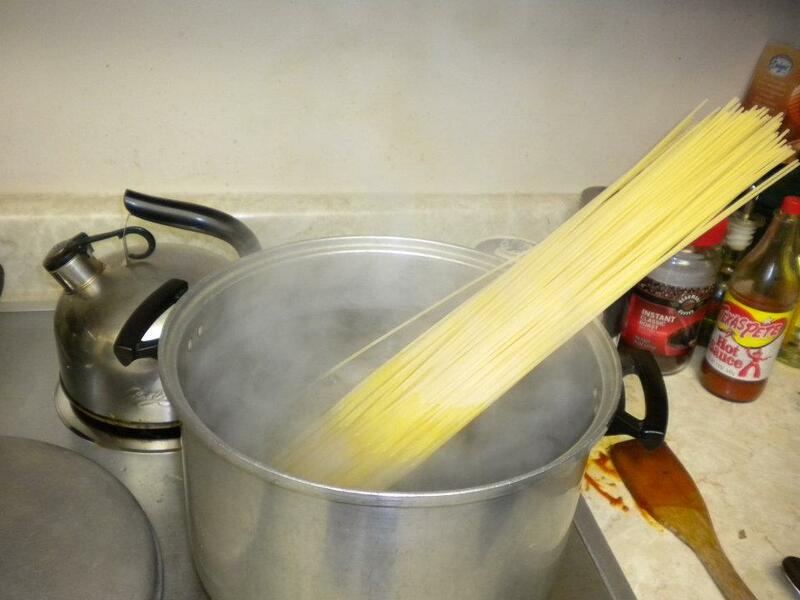 In a pot of water with a serious, rolling boil, the spaghetti softened up and shrunk down in about 20 seconds. It was delicious. I love Philly. Next time I’m going to bring a cooler, a lot of ice, and come home with a serious supply of cheese and sausage as well. We actually did have a cooler with us this trip, but we were planning on spending the rest of the day out around town and didnt want to chance losing the meat. It’s ok though. There will definitely be a next time! When in Rome… fry an artichoke? They say no one but a Roman can cut an artichoke this way. 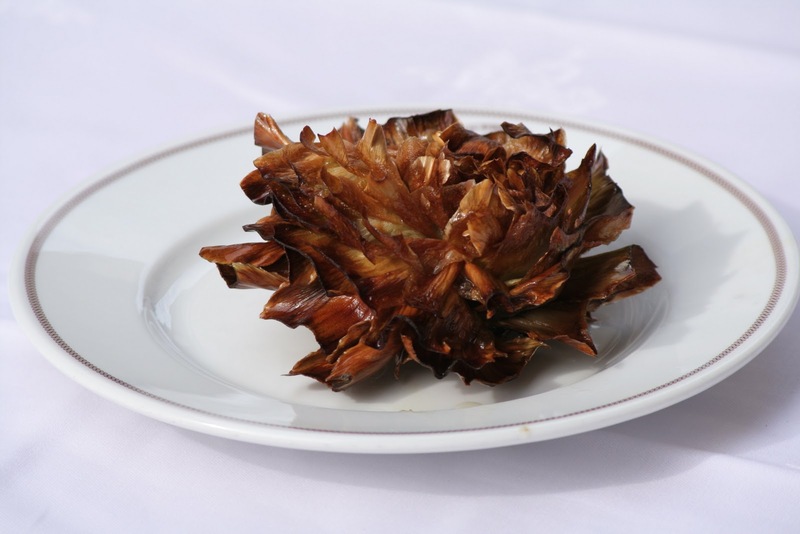 Originating with the ancient Jewish population in the Ghetto of Rome, carciofi alla giudia (car-CHO-fee alla JOO-dee-aa, for my non-Italian speaking readers) is an artichoke that has been fanned out and deep-fried, creating a crispy-on-the-edges, soft-on-the-inside texture. It’s like a fan of potato chips that are a little chewy in the very center. I’ve never been a big veggie person, but I LOVED this when I had dinner in the Ghetto. I wonder if you can get these anywhere in America? I want to try to make these. I bet James would be afraid to try them, but he usually trusts me. I can’t wait to see what happens! Saturday night James and I went to a birthday party for my cousin at Buca di Beppo. If you’ve never been, it’s a family style Italian American restaurant known for its retro, gaudy, Italian grandma’s house decor. The yellow walls are loaded down with wild pictures of nuns roller skating, babies flipping people off, and young ladies eating spaghetti in bikinis. We ate in the pope room, a round semi-private eating area with a huge round table with a bust of Benny XVI in the center. It was frickin’ awesome. What’s really awesome, though, is the food. We ordered chicken that was stuffed with prosciutto and mozzarella laying in a bed of pesto cream sauce. It was AMAZING! I’m ready to go recreate this at home. Among other food news, I’m trying to decide what to put in my wedding registry. You know, other than the usual china and stuff. I’m thinking utensils for crabs (since we’re in Maryland), a wok, a pizza stone, holiday themed dining ware, and other non-standard registry items. Any ideas of what I should include, considering I’m someone who loves to cook? 1. Antipasta: Imported Italian cold cuts (Prosciutto, Capacolla, Mortadella, Sopresatta), cheeses (Provolone, Mozzarella, Fontina), my mom’s antipasta salad (roasted red pepper, mushroom, artichoke, capers), Aunt Annie’s tuna salad (with vinegar, not sure what else is in it but it was good), and Italian bread. 2. THE soup. It’s made with lamb and escarole, and comes from the village my mom’s grandmother is from (Rosetto Valfortore, near Foggia). 3. Homemade spaghetti, meatballs, and bracciole (Steaks pounded thin and rolled up with provolone and prosciutto. In Italy they call this involtini). 4. Salad. Usually we don’t have room for it, but we try to eat a few bites. 5. Pork roast. We try. Again, no room. Many years we end up skipping this or saving it for another day. Dessert: cannoli, tiramisu, all kinds of pies, cookies, and my mom’s dream pie (Walnut crust, cream cheesey layer, chocolate pudding, cool whip, amazingness). Someday when I have my own house, I’ll do this again. My aunt is doing something like this for us this year, but it’s not the same when it’s not at our house. I really do miss having a home. But it’s ok, I WILL do this again someday. I hope it’s not too far in the future. I’m a huge fan of pasta carbonara, especially when done right. If you’ve never had it, it’s basically pasta and bacon with a creamy egg-based sauce coating the pasta. In other words, heaven. 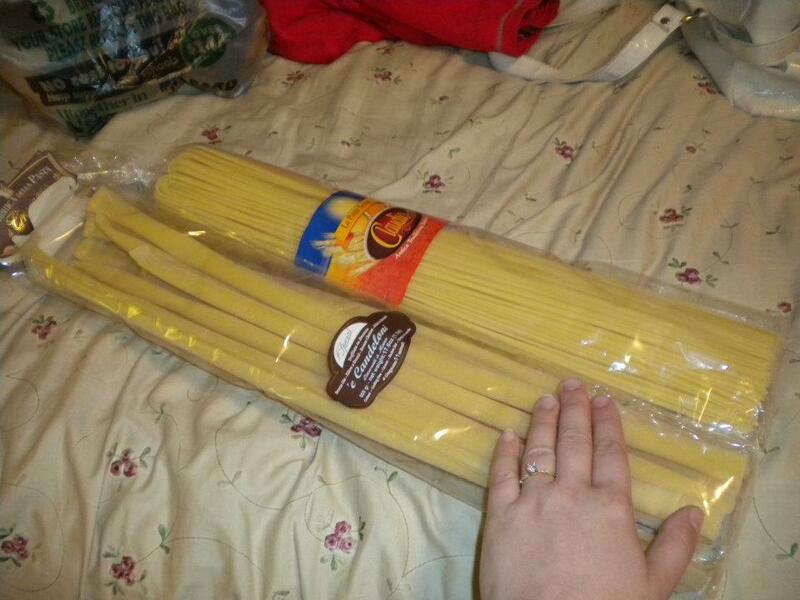 Cook 1 lb pasta (thin spaghetti works best) according to package directions. While pasta is cooking, drizzle about 2 tbsp olive oil in a frying pan. Add about 1 clove fresh minced garlic. Throw in a tbsp of butter if you really want it to be delicious. Chop 2 chicken breasts into bite size pieces, and add to pan. Saute together until chicken is cooked but not tough. In a separate bowl, whip 4 eggs until completely smooth. We don’t want ANY egg clumps. Whip in a few tbsp heavy cream if you have it. Add about 1/4 cup parmesan cheese. When pasta is done cooking, drain and return to pan. Add chicken and some of the juice of the frying pan to the pasta. Add egg mixture to pasta, stirring quickly and constantly. The goal here is for the egg to coat the pasta before the hot pasta cooks the egg. The last thing we want are egg clumps. We want a nice, shiny coating. Don’t worry, you can do it. Just do it quickly.